Today’s blog comes our Hotline Assistant, Ani and it’s just in time for this weekend’s festivities! If you’re in need of some DIY inspiration, you’ve come to the right place. Read on to learn more about our favorite Halloween costume and decoration ideas that keep the earth in mind! “What are you going to dress up as for Halloween?” …that is the big question this month. The one time in the year when you can be Superman and no one would question it! Instead of purchasing a costume (that you might see someone else wearing at a party), tap into your creative side and make your own costume! Here are a few of our favorite DIY costumes that our staff have done over the years! Our staff members take Halloween seriously. Best part? We use what we already have in our closets to help reduce waste! Cardboard Tube Creatures are fun, festive, and best of all? Reusable & recyclable! Check out these decorative pieces made out of wine bottles! All you need is some spray paint and glitter (optional). Click HERE for the full tutorial. DIY Halloween wine bottles are easy to put together with a little creativity and paint! Spook some people with your creativity! Before you toss your aluminum cans into the recycling bin, give them a second life as Frankenstein tin cans! Add a couple wine corks to the sides for bolts, googly eyes, and you’re set! Check out the steps for this DIY project click HERE. Frankenstein tin cans are easy to store with your other holiday decor or toss them in the recycling bin (after removing the corks & googly eyes). When November 1st comes around, remember to store your creations for next year or recycle them in your curbside blue bin. 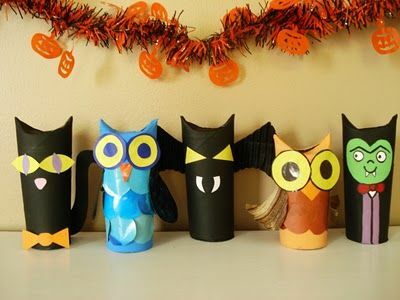 For more DIY Halloween decoration ideas follow us on Pinterest, you will also find some scary-good costume ideas. Don’t forget that the best thing about Halloween is making your costume! Check out our Affordable and Eco-Friendly Halloween Costume blog for inspiration. Also, be sure to share your creations with us on Facebook and Instagram, we’d love to see them! Happy Halloween gals and ghouls!